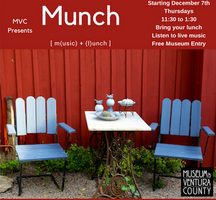 Grab a lunch and head on over to the Museum every Thursday between 11:30 a.m. and 1:30 p.m. for music by local talent. Feel free to tip the musicians! For information visit venturamuseum.org or call 805.653.0323.